In this video, we will discuss about drilling down and displaying hierarchical data in gridview controls without using any datasource control. 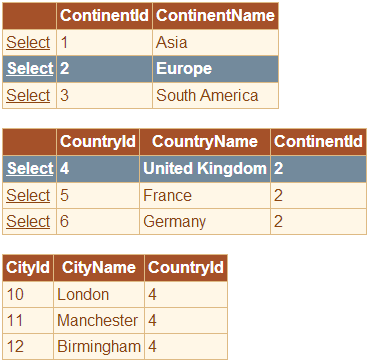 We will be using the following 3 database tables for this demo. To retrieve continents, countries and cities data and display in gridview without using datasource controls, we need to create respective data access layer class files. We discussed about this in Part 35. Click here if you need this code. Now drag and drop 3 gridview controls on webform1.aspx. Configure GridView1, to include 2 TemplateFields and 1 BoundField. 1. The first TemplateField should contain an ItemTemplate, which includes a linkbutton, that the user can click. 2. Set the CommandName property of the LinkButton to SelectCountries. 3. The second TemplateField should contain an ItemTemplate, which includes a Label control, that binds to ContinentId column. 4. The BoundField get it's data from ContinentName column. 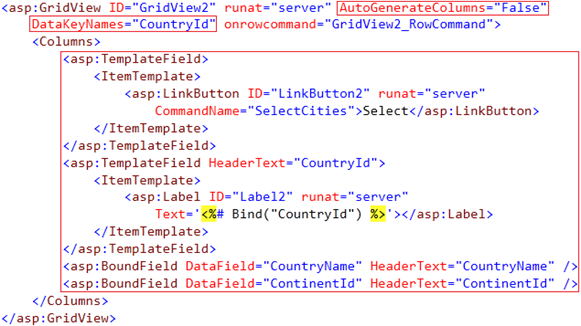 Configure GridView2, to include 2 TemplateFields and 2 BoundFields. 2. Set the CommandName property of the LinkButton to SelectCities. 3. 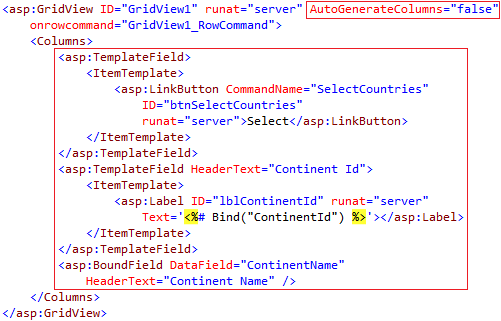 The first TemplateField should contain an ItemTemplate, which includes a Label control, that binds to CountryId coulmn. 4. The first BoundField get it's data from CountryName column. 5. The second BoundField get it's data from ContinentId column. 6. Set AutoGenerateColumns property of GridView2 to false. 7. Set GridView2 property, DataKeyNames="CountryId". GridView3 does not require any additonal configuration. Just the HTML as shown below. Now generate RowCommand event handler methods for GridView1 and GridView2. At this point the HTML on WebForm1.aspx should be as shown below. Hi Malavika, details view concepts are discussed in Parts 37 to 41 in asp.net gridview tutorial. Please click here to access asp.net gridview tutorial. I hope you will find them useful. I am using .net framework 3.5.
could not find the 'gridview.selectrow(rowindex)' method in onrowcommand﻿ event, instead I am getting SelectedRow method. is there any way around to select the row in onrowcommand event in .net 3.5?